The National Weather Service confirmed that the strong storms that blew through Baltimore on Friday night, killing two people and damaging multiple buildings, indeed contained a tornado that had a wind speed of 105 mph..
WASHINGTON — Debris swirled, funnel clouds were visible, light stanchions were toppled over and several buildings incurred damage, including an Amazon sorting facility in Baltimore, as a tornado touched down Friday night. On Saturday, the National Weather Service confirmed that the EF-1 tornado with an estimated maximum wind speed of 105 mph touched down in Baltimore, and while the tornado is classified as “weak” on the Enhanced Fujita scale, the tornado caused extensive damage, killing two people and injuring another. The tornado hit the Baltimore area at 9:42 p.m., first blowing over tractor trailers on Interstate 95, just north of the Fort McHenry Tunnel, then blowing over a fence line on South Newkirk Street and even blowing in garage doors on the Flexi-Van Leasing facility as it moved toward Dundalk. The tornado reached peak intensity as it moved east and hit the Amazon Fulfillment Center, where a 50-foot wall collapsed. Fifty-four-year-old Andrew Lindsay and Israel Espana Argote were killed, and another person was hurt, police said. 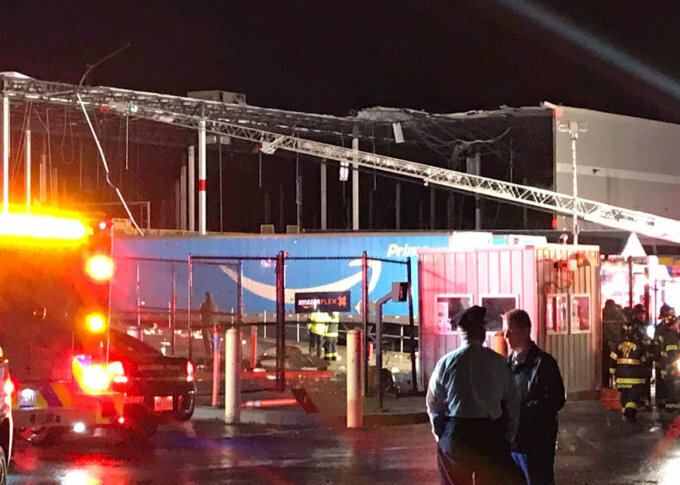 The weather service said that weakened concrete wall panels collapsed into the building after parts of the roof of the facility, including iron rafters, were initially blown off. My sincerest condolences go out to the families and friends of the victims, and our administration stands ready to assist Baltimore City and other areas impacted by this severe weather in any way we can. The tornado lifted as it reached the intersection with Dundalk Avenue but then it briefly touched down on the Holabird Apartments on 4 George’s Court in Dundalk. The roof came off of the northeast building and the building broadside, said the weather service. The damage to the apartment building displaced 64 people, including 40 adults and 24 children. The Baltimore County Fire Department said the residents of that apartment will be displaced “for an extended period.” The Red Cross, emergency management and Baltimore’s Health and Human Services department set up shelter at Ateaze Senior Center. Among the damage, about a dozen truck trailers were pushed over, car windows were blown out by flying debris and large trees were uprooted. Roof damage, downed wires, and fallen trees were also reported throughout Harford County, Baltimore City and Carroll County. In Carroll County, the National Weather Service confirmed another tornado touched down near Mount Airy, causing damage to a gas station canopy and a number of commercial buildings. “A TJ Maxx, a few mobile homes and other homes were actually heavily damaged. A lot of trees down, power outages in that region as well,” Kammerer said, adding that a “tornadic signature” was visible on weather radar where the most damage was reported. The National Weather Service had issued a Tornado Warning for the Mount Airy area around 10:30 p.m.
Home Goods and TJ Maxx stores were condemned by a building inspector due to severe roof damage, a spokesman with the Mount Airy Volunteer Fire Company said. He also said that the storm damaged three mobile homes in the Pheasant Ridge mobile home park. Sunday: Mostly sunny and mild, with highs in the upper 50s. Don’t forget: Daylight Saving Time ends. Monday: Mostly cloudy. A few showers possible throughout the day. Highs near 60. Tuesday: Mostly cloudy with showers likely. Heavy rain possible in the evening. Highs near 70. WTOP’s Alejandro Alvarez, Teta Alim, Abigail Constantino, The Associated Press and CNN contributed to this report.